While in Argentina in 2004 I interviewed Maba and Valde, a sister and brother from one of the Movements of Unemployed Workers groups, MTD Solano. Interviewing them separately, I asked them what they value most about their work with the MTD. Both answered that they like how integrated their lives are now. Maba said that while many join MTDs out of necessity, she joined by election, because her life felt too fragmented before. Now nearly everything she does is related to MTD Solano; her work at a collectively run cafe, a children’s workshop she organizes, her neighborhood, her family, etc. All of her activities share a meaning and purpose. Many SNCC members report that before 1964, they often experienced a sense of harmony and certainty that is rarely felt by other Americans. Their lives were not fragmented. Instead of filling a series of largely unrelated roles (parent, employee, citizen), they filled only one role: SNCC worker. Instead of balancing in their heads a multiplicity of values, all of them tentative, they had one certain, absolute set of beliefs. The group provided a world order that is far more complete and stable than any that individuals could assemble for themselves. I can relate to this sense of harmony. I felt it intensely during the Minnehaha campaign and land occupation in Minneapolis to stop the controversial rerouting of a highway through a neighborhood, parkland, and sacred sites to the Mendota Mdewakanton Dakota Community and the American Indian Movement. For sixteen months we did everything together; cooking, eating, cleaning, building tree houses and barricades, meeting, working security shifts, singing, sitting around the campfire, getting arrested or beaten up by cops, etc. When I would leave camp, it was to go produce or distribute flyers for events related to the campaign. Encapsulation occurs when a movement organization develops an ideology or structure that interferes with efforts to recruit members or raise demands. …members may develop such strong cohesion among themselves that outsiders become unwelcome. In prolonged interaction, a group may develop an ideology that is internally coherent but virtually unintelligible to recruits and outsiders who do not share all of the members’ assumptions. Such groups are not uncommon in movements; they constitute the fringe of organizations that appears strange to outsiders. An encapsulated organization may find it easy to maintain its dedicated core of members, whose identities are linked to the group and who may have few outside contacts, but such groups have little chance of growing or increasing their influence. Most strikingly, they may lose interest in such things, contenting themselves with maintaining their encapsulated existence. Full-scale encapsulation could not occur in the context of the Minnehaha occupation for the same reasons that it could not occur with SNCC or SDS. These were political campaigns with regular interaction with a larger public. Still, in each of these cases a core group developed a strong cohesion that, at least at times, tended toward encapsulation. In the case of SDS many core members broke with public organizing to form the Weather Underground, which had virtually no dialogical interaction with any public. How prevalent is this phenomenon within social movements? While full-blown encapsulation is relatively rare, still, the tendency of social change agents to create identities that distinguish them from others, and to become insular, is very common. The negative impact of encapsulation is disproportionately detrimental, because it tends to occur especially among the most dedicated social change agents; people who give all or nearly all their time and energy to social change efforts, and who are often ready to sacrifice even more. Movements need these people to be successful. That is, movements need some people who are heart-and-soul dedicated to the cause, flexible and free from other commitments or distractions. Critical as these people are, still, they comprise a very small percentage of any successful social movement. To be successful, movements need tens of thousands—if not millions—of people who are willing to give something. To get plugged into movements in ways that build capacity, these folks generally need, first, to feel welcomed by, and then, some direction from, the more involved change agents. If these dedicated change agents fail to engage the next tier of potential movement participants, they will certainly fail to engage the broader society. These potential participants are not even the base, but rather the start of the base needed to affect the kind of systemic overhaul we imagine. Therefore, the interplay between these tiers of movement participants is of critical importance. Encapsulation and the general tendency of activist groups to self-isolate, prevents this needed relationship, creating an unbridgeable chasm where there should be a continuum of levels of involvement (as well as levels of political analysis), and leaving dedicated radicals cut-off like lone guerrilla fighters in enemy territory. It may feel glorious, but it’s a suicide mission. To prevent self-isolation and encapsulation in social movement groups, activists first need to recognize the problem. We need to examine how our groups’ collective rituals and alternative narratives, if unchecked by an imperative to strategically engage society, will tend toward self-isolation. We need to see how profoundly this limits the potential power of our movements. When protest tactics become primarily collective ritual without regard to a strategy for broader engagement, then much of the nonparticipating public is likely to associate the given issues with the particular ritual, or the “type” of people who perform the ritual. People who sympathize with the issue or goal may not become active in the cause because they are not interested in assimilating into—or being identified with—a fringe subculture, or because they see a lack of strategy. The above is an abridged version of the second part in a series that I published in 2006. 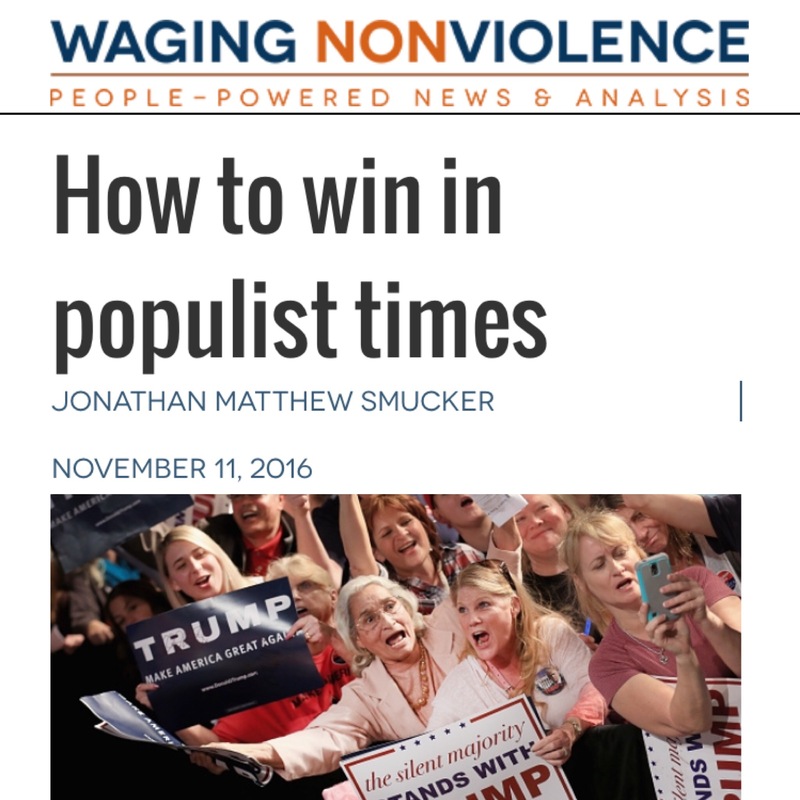 The original post can be read in its entirely here, and the full three-part series, What Prevents Radicals from Acting Strategically? is here.